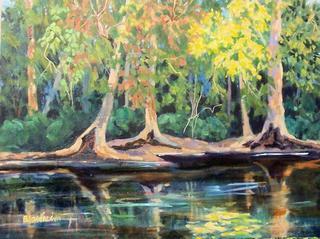 Award winning painter, Linda Blondheim lives in Gainesville, Florida and works primarily in oils and acrylics. Linda is a listed artist with Art Price, Ask Art, The American Artist Bluebook, and Marquis Who's Who in American Art 2007. She has a museum history in Alabama, Florida and Georgia, and is gallery represented in Alabama, Florida and Georgia. Her work is often described as painterly realism, or representational painting. Sometimes she is referred to as a representational expressionist or American impressionist. She enjoys plein air painting almost year round because of the mild Florida climate, but enjoys traveling throughout the south to capture the beauty found in each state. Much of Linda's work is done en plein air, but she does enjoy working from plein air studies to complete larger works in the studio. Her paintings are found in private and corporate collections throughout the United States. Beautiful vibrant work Linda. I can't wait to see more.